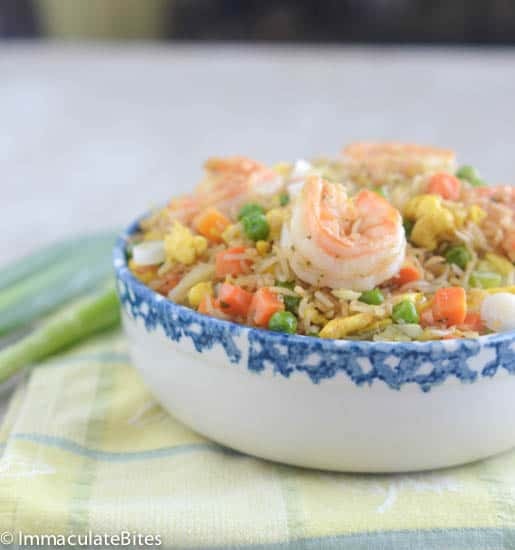 African Caribbean Shrimp Fried Rice – a spicy rice dish with plenty of flavor with chunks of shrimps, eggs and veggies. A complete meal on its own! Yikes it’s ‘fried’, but its fried rice… You have never had rice until you have had ‘African fried rice’. However, here is the catch… I had never heard of African fried rice till I set foot on US soil. Imagine that, born and raised in Cameroon, West Africa, jellof rice was one of those staple foods we grew up with as an all time favorite meal any time we had a family get together, or needed to impress someone, but we never had fried rice. Now jellof rice as featured here has been placed in the back seat, fried rice has taken over. 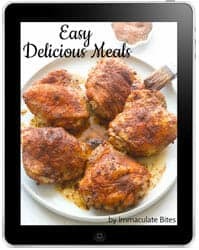 The key to this recipe is the perfect blends of herbs, vegetables and grains, creating a spicy dish with plenty of flavor that you can taste in every bite. It is the “to die” for filling meal. Can you tell I love this?. Sincerely, my nieces, nephews and even my son dig in to this meal without ever raising their heads until their plates are empty. Needless to say Aunty Emma is THE best cook! They would often say . Though African fried rice is spicy it is not hot. Happily enough, there are no defined ingredients as it varies based on the culture, for instance, I have had some friends refer to this as ‘Caribbean fried rice’, complimented by specific Caribbean ingredients and herbs for a unique island taste. So feel free to change the recipe around a little, substitute vegetables and still get the same wholesome aroma and meal. 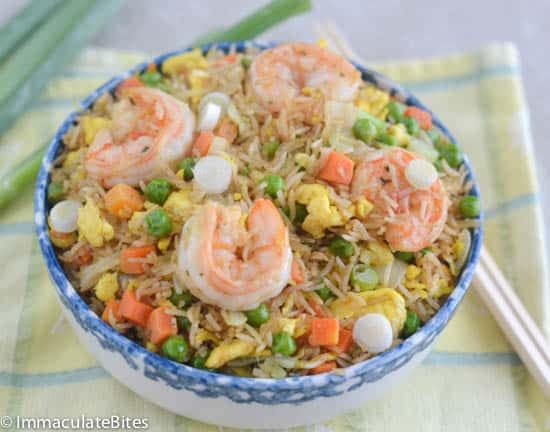 This fried rice starts with perfectly cooked long grain rice, eggs, vegetables, shrimp, onions, vigorously stir fried with soy sauce spiced up with green seasoning featured here ( a tasty blend of green leaves and garlic) and a touch of curry powder to give it a uniquely exotic flair. 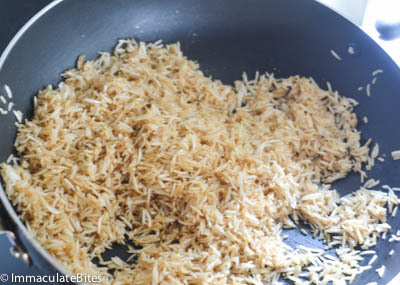 Just a hint, ‘Day old rice’ is preferable because it is dried out and can withstand the stirring that is often applied to fried rice, without becoming soggy. 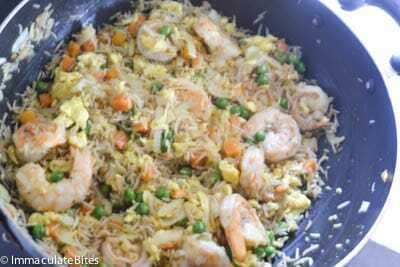 For this recipe, I used basmati fried rice. It is important to have all the ingredients ready ahead of time before you begin cooking. 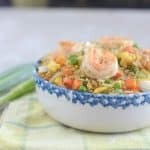 African Caribbean Shrimp Fried Rice - a spicy rice dish with plenty of flavor with chunks of shrimps, eggs and veggies. A complete meal on its own! Break up the clumpy rice before starting. Heat a large wok or skillet on medium high heat with about a tablespoon of canola or vegetable oil. Add the rice stir vigorously for about 2-3 minutes adding soy sauce and a tablespoon or more of water or chicken/beef stock as need to moistened rice. Set aside. 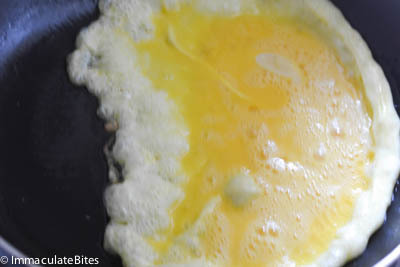 Quickly wipe the wok or skillet with a clean paper towel or cloth. Heat 1 teaspoon oil in the wok; add shrimp and sauté until just cooked through. Remove add to the fried rice. 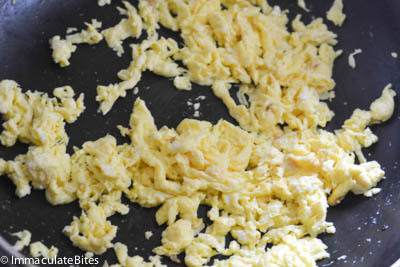 Next add a table spoon of oil , let it heat up , then add the eggs and quickly stir to break the eggs apart. Remove and add to the rice. 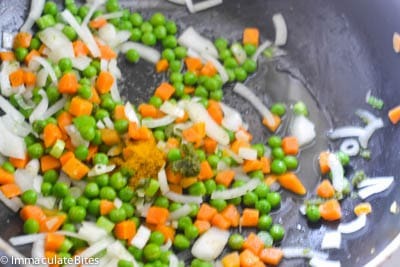 Continue with the stir frying by adding a tablespoon of oil into the wok, followed by onions, peas, carrots, green seasoning, curry powder, and chicken bouillon powder. Stir until fragrant for about 2 minutes. 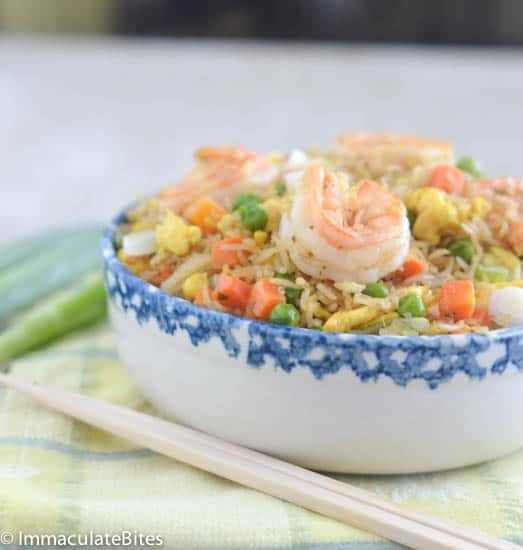 Finally return the combination of rice, eggs, and shrimp to the wok. Stir until everything has been fully combined. Adjust seasoning salt, pepper if necessary. curry powder and green seasoning . Score!!! I used shrimp stock instead of water for my rice and it was so good. 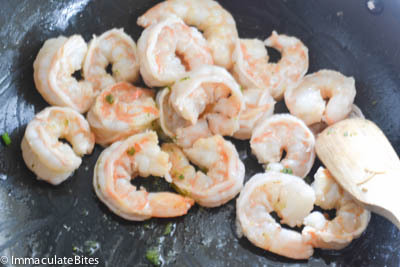 We love shrimp so that’s why I tried this. The coconut milk made it soooo creamy. I am so appreciative of your site. Thank you so much Chan. Yummmmyy, I tried this, and everyone loved it. Thanks for the immaculate recipe! Alice, am glad you liked it. Imma eeeeh! Thanks for the little tips eeeh! I have tried this recipe several time but just could not get it right. This time with your little tips I think o got this. Merci! The girl, Thanks for this recipe. I love this when Gwen makes it. I am right now copying your recipe and believe me I go getam right! Thanks for the tips oh! I’m Monica e sono italiana.Ho un blog L’emporio 21 e ho fatto una tua ricetta “Puff Puff”Grazie!! sono buonissimi!You are wonderful!! Thanks Monica, am glad you like it. Just the look of it makes me salivate. This is good food and easy to make. Thank you so much Immaculate bites. 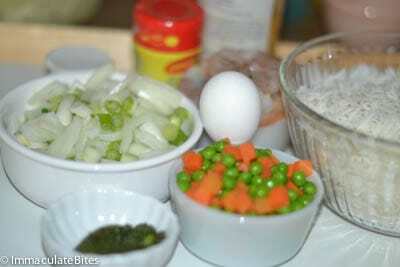 Following your recipe I can cook fried rice with much confidence knowing that my guest will enjoy this delicious meal. Continue to do what you do to make women especially to get to visit the kitchen and fix something tasty for themselves or families.